Bo’s Jigsaw Puzzle is a new iPhone/iPad puzzle app currently free. Another puzzle app however it has no other in-app purchases and features 24 different puzzles. A choice of easy (four pieces), intermediate (9 pieces) and hard (12 pieces) levels are available providing graded opportunities for each puzzle. Geared to young learners ages 2-6 years, the graphics are cute images of animal like characters or kids. When assembling the puzzle you do need to place the puzzle piece very close to the appropriate location for them to pop into place. Pleasant background music is played with the app. No setting or controls are available to turn the music on and off, however muting your volume is always possible. 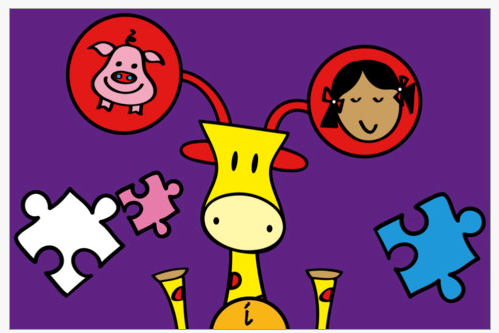 If you are in need of a puzzle app for young students, Bo’s Jigsaw Puzzle is currently free. I suspect it will be for purchase after its initial debut. Another puzzle app for your OT iTool Kit! This entry was posted in App Reviews, Apps for OT's, Apps for Special Needs, Early Childhood, Elementary School, iPad, iPhone, iPod, Occupational Therapy, Pediatrics, Special Needs, Visual Perception and tagged App Review, iPad, iPhone, iPod, OT Apps, special needs students, Visual Perception. Bookmark the permalink. A great little app for children that love jigsaw puzzles.